Randy and Holly Smithey's kinetic garden stake reflects the joy of seeing a butterfly dance across your yard. What makes a butterfly so magical? Their vibrant wings and soft flight? Or the way they disappear, seemingly, into thin air? 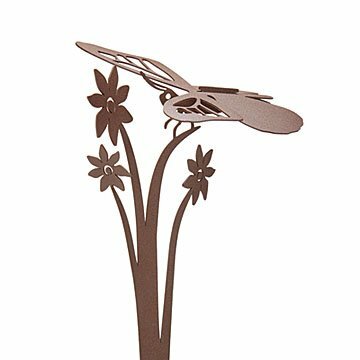 Keep that elegance around always with Randy and Holley Smithey's kinetic garden stake that reflects the joy of glimpsing a butterfly's aerial acrobatics. Each hand-formed, recycled steel sculpture captures the unique silhouette and hovering motion of the tiny aviators. With just a gentle breeze, the balanced wings will move and mimic the motion of the intricate insect. Handmade in Bend, Oregon. For Randy and Holly Smithey, creating is a shared passion. They are artists, crafters, sculptors, and painters. With all their work, they find inspiration from where they live. Nature in its varying forms of texture, motion, and grandeur is always the underlying theme for what they create. Randy and Holly's bird sculptures were born out of their love of birds and from what these amazing creatures bring to the world. They wanted to capture the joy of a bird in flight with an artistically designed, wind powered sculpture. This item ships in two pieces, as the wings are not set in place. I love these and have purchased a few. I use some in my garden and some in my flower beds. Beautifully designed, crafted and finished. I have the hummingbird in our garden. Liked it so much we gave the butterfly. I could not have been happier!! I was looking for the perfect gift for my mom, who really doesn't need anything. This was so unique and something she could use and enjoy every day! I loved it and so did she! !